The flex-serve business model has been around for about 20 years. Former car wash operator and consultant Steve Okun introduced it as an alternative to full service. Flex serve works just like a “stay-in-the-car” express exterior. However, instead of rows of free-use vacuums, there is an after-care area or facility with service bays to provide assisted services. This attribute allows flex serve to capture more customers than full service, requires less labor than full service, and provides a competitive advantage by being different and serving a niche market. Flex serve flourished for about a decade, but it has been obscured somewhat since the last recession. Principal reasons for this include robust growth of express exterior, high start-up cost, and labor burden. For example, flex-serve design and layout requires at least one acre of land and 6,000 square foot of building. With prime real estate, start-up expense of $3.5 million or more is not uncommon. This is usually beyond what most mom and pop investors can afford to build. Then there is labor. Flex serve requires twice the number of employees as express. It also requires management with a higher level of experience, knowledge, and skill. The reason for this is employees must perform service work on customers’ vehicles post-wash such as interior cleaning and various detail services. Consequently, given construction trends and the conversion rate of stores to express, we should expect a shortage of facilities capable of providing assisted services going forward. Since assisted service is not part of the vernacular of today’s shakers and movers in the car wash industry, this should create opportunities for folks willing to prospect the gaps in the supply chain. For example, consider the number of companies that are launching small-scale retail spaces such as Walmart-To-Go, Target Express, and Tao Café. These ultra-condensed stores offer curated selections to better cater to discerning urban shoppers pressed for time. Today there are 1,400-square-foot department stores, pop-up restaurants in laneways, and even entire shopping malls that occupy just 6,800 square feet. For example, Tao Café is a 200-square-foot store from Alibaba that opened in Hangzhou, China. It offers shoppers a completely self-service experience, as the offline e-shopping destination is completely staff-less. To make small purchases such as fast food and snacks, consumers must use Alibaba’s e-commerce app for transactions. Patrons are scanned on entering and identified using facial recognition technology. When placing an order, say for a cup of coffee, one’s profile picture appears onscreen with an estimated wait time. As customers leave, their purchases are automatically processed via the app. 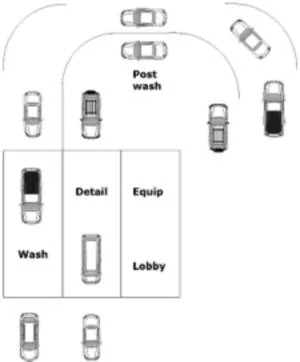 Arguably, there is no reason why this concept can’t be applied to car wash.
For example, shown above is a design and layout for a condensed version of a flex-serve operation. This fits on 15,000 square feet of land plus 4,500 square feet for parking (not shown). The building footprint is 3,000 square feet. Equipment options are a 60’ conveyor or 50’ express in-bay automatic. Detail options are two service bays or one automatic vehicle polisher (rollover). In most markets, start-up expense would be similar to that of a high-end self-service wash or around $1.5 million. Capacity of the plant has a range of up to 60,000 cars per year. Minimum staff requirement is three persons, average five, and maximum nine. Forty percent gross net business. Like a full-size flex, it would appeal to Millennials, Generation-X, as well as Baby Boomers. Moreover, labor can become a barrier to market entry rather than a burden.